Why would you waste your money on a Disney World tips book that doesn't have that many tips? This book is all about tips - 250 of them! There's no philosophy of tips, no long stories about how magical a tip made my vacation, and never just one tip per page. If you want tips, then this is your book. It's only 45 pages, but it is full of just tips. There are tips about each park, tips about dining, tips about where you can take a nap in each park (for real! ), tips about getting around Disney World, and tips about which attractions might be too scary for your kids. Your Disney World experience will be better, less stressful, and easier to plan with these tips. Go ahead and click above to check out the book! MAGIC KINGDOM: "When leaving the park from Adventureland, cut across in front of the Crystal Palace Restaurant instead of following the sidewalk directly to Main St."
EPCOT: "Is it raining? Duck into the interactive parts of most Future World rides, the shops in the countries of World Showcase, The American Adventure show, or any of the country movies (Canada, France, and China)." HOLLYWOOD STUDIOS: "Fantasmic! can be too scary for children. However, if your kids make it to the end of Fantasmic!, then the show ends with a boat that is full of Disney characters." ANIMAL KINDGOM: "Flame Tree Barbecue offers one of the biggest meals that's part of the Quick Service Dining Plan. It's a meal you can likely share, which will save one of your meal credits!" TICKETS: "If you purchase Park Hopper, keep in mind that Magic Kingdom is often open later than other parks and you might be able to accomplish as much with one full day and some added evenings at Magic Kingdom as you would if you dedicated two full days to Magic Kingdom." HOTELS: "If you have a refillable mug from your Disney resort, you can refill it in any Disney resort." DINING: "If you aren't using a dining plan, you can usually order off the children's menu regardless of your age. This is especially true in quick service restaurants. You need to ask your server in table service restaurants." GETTING AROUND WHILE THERE: "Fort Wilderness Resort is massive. If you are visiting there from another resort, know that it has its own bus system and it might take you awhile to get to your destination within the resort after you arrive." A teacher by heart and experience, I have been to Disney World as a child and as a parent. I've taken my kids when they were both younger and older. 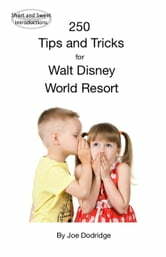 I've written two Disney World books - this tips book and two editions of A Short and Sweet Introduction to Walt Disney World Resort. I've even combined these two books into one combo book (click on my author name above for links to these books). I understand that Disney World can be overwhelming and that you don't want to waste a year's worth of time planning a weeklong trip. My books teach you what you need to know, give you some great tips to make your trip easier, and don't overload you with tons of useless information. Do you have tips for each park? Yes! This book contains tips for all four theme parks and both water parks. Is this book endorsed by Disney World? Absolutely not! This book is full of honest tips - whether Disney World likes them or not. Will this book help me save money? Yes! This book contains money-saving tips throughout the entire book. It even includes a page called "Ways to Pinch a Penny." What's in this book that I won't find in other books? This book contains sections just about attractions that might be too scary for little kids, places you get some air conditioning on a hot day, and even places where you can catch a quick nap! OK, you've made it this far! This book packs a lot of bang for just a little money. What are you waiting for?